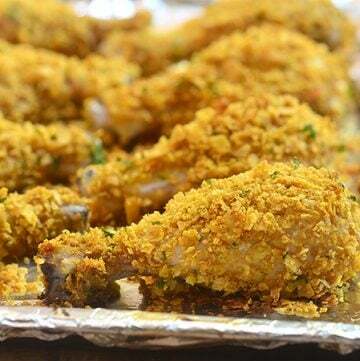 Cornflake chicken coated in cornflake crumbs for crunchy, juicy chicken perfection without deep-frying. Loads of flavor with less work and less fat! 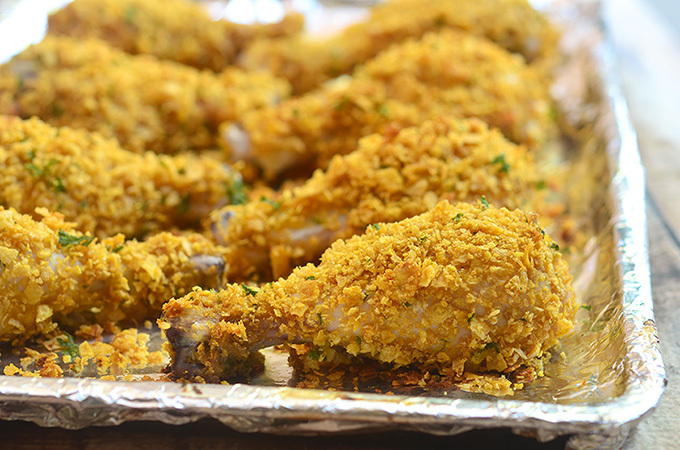 If you’re looking for oven “fried” chicken that’s golden and crisp on the outside yet moist and flavorful on the inside, this cornflake chicken is a keeper. They’re so tasty and are sure to be a family favorite. 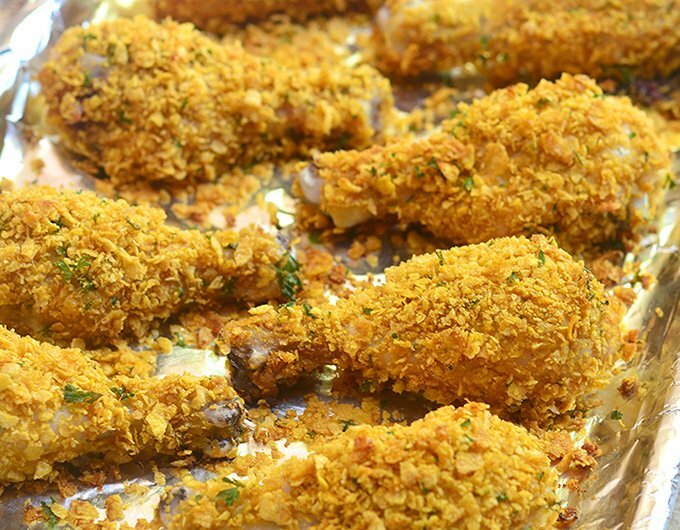 The skinless drumsticks (works well with boneless chicken breasts, too!) are first marinated in seasoned buttermilk for at least 4 hours (or overnight for best results) to tenderize the meat and impart flavor. 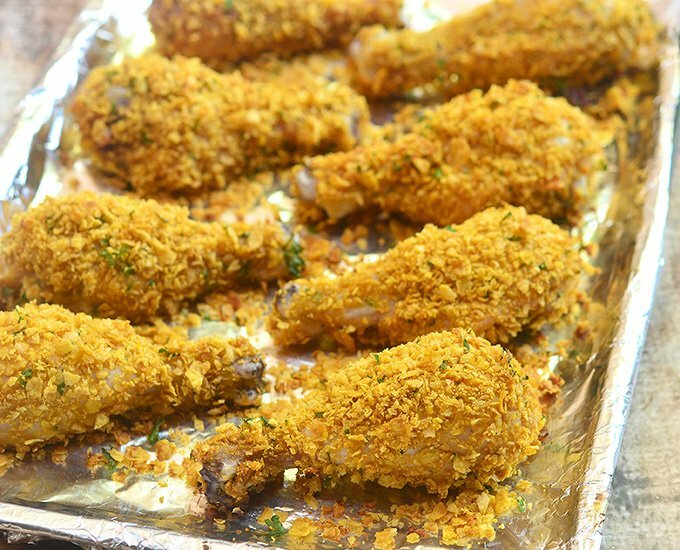 They are then dredged in a mixture of crushed cornflakes, minced fresh parsley, and spices, and baked in the oven for super crunchy and juicy pieces without the hassle of deep-frying. 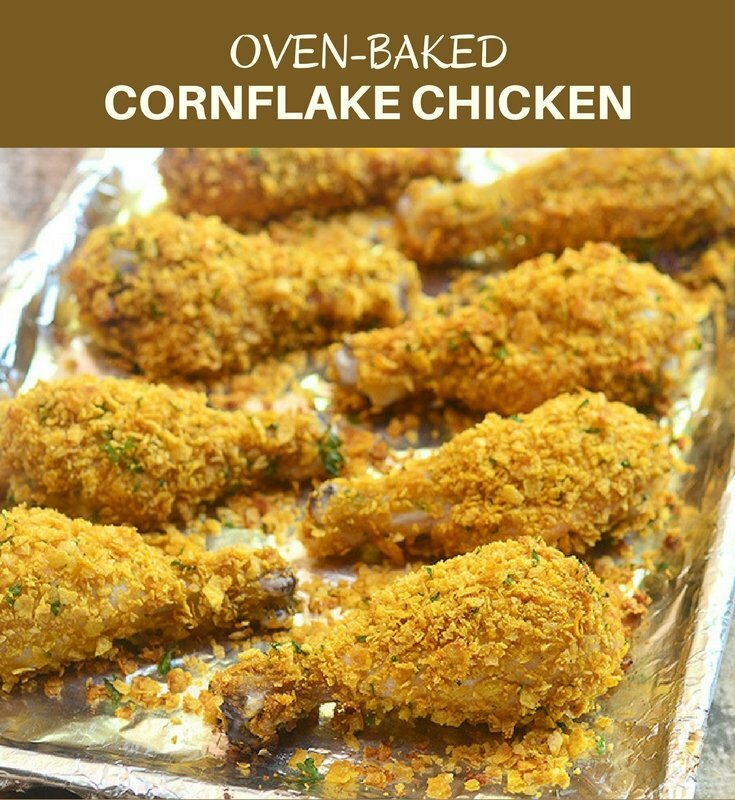 Marvelous with sides of mashed potatoes and buttered veggies, this cornflake chicken is a regular at our dinner table and never fails to please. They’re super tasty but with a lot less work and fewer calories. Enjoy! Holding the chicken with drum part side up, pull the skin down towards bone to completely remove. Discard skin. In a wide, shallow dish, combine buttermilk marinade ingredients: buttermilk, hot sauce, salt, sugar, and pepper. Add chicken and massage to coat. Marinate in the refrigerator for at least 4 hours or overnight for best results. Line a baking sheet with foil. Set aside. In a large bowl, combine cornflake coating ingredients: cornflakes, fresh parsley, salt, cayenne pepper, garlic powder, and pepper. Toss to combine. Add olive oil and toss together until cornflakes are moistened. Let chicken stand at room temperature for about 30 minutes. Drain from marinade and immediately dredge in cornflake mixture, patting down crumbs to fully coat. 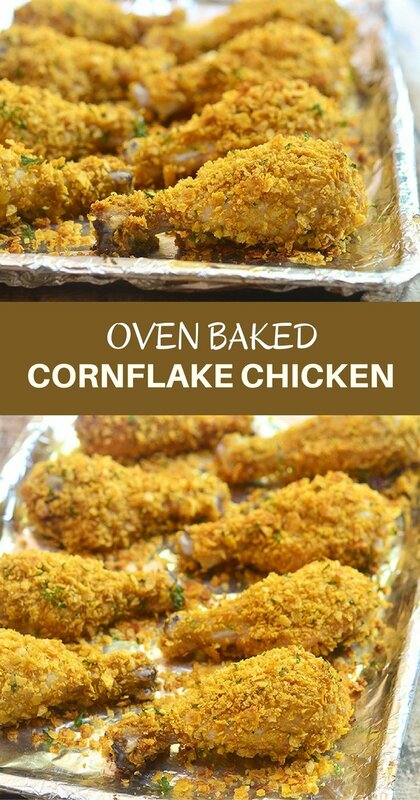 Arrange in a single layer on prepared baking sheet and bake in a 375 F oven for about 35 to 40 minutes or until golden on the outside and thermometer inserted into thickest part reads 165 F. Remove from pan and serve hot. Looks delicious! I’ve been looking for new chicken recipes lately. I’ll bookmark this!